Auckland, New Zealand - Vesper Marine, a leading designer and manufacturer of innovative marine safety products, has today announced the appointment of IMDS (International Manufacturers Direct Sales) as its sales representative throughout Europe. With over 50 years’ experience working in the European marine market IMDS will represent Vesper Marine’s smartAIS and WatchMate products amongst a rapidly growing number of distributors, dealers, retailers and OEMs. Vesper Marine’s smartAIS systems are increasingly specified by leisure and commercial users worldwide. Offering high performance, reliability and installation advantages, smartAIS proactively alerts boaters of potentially hazardous situations. 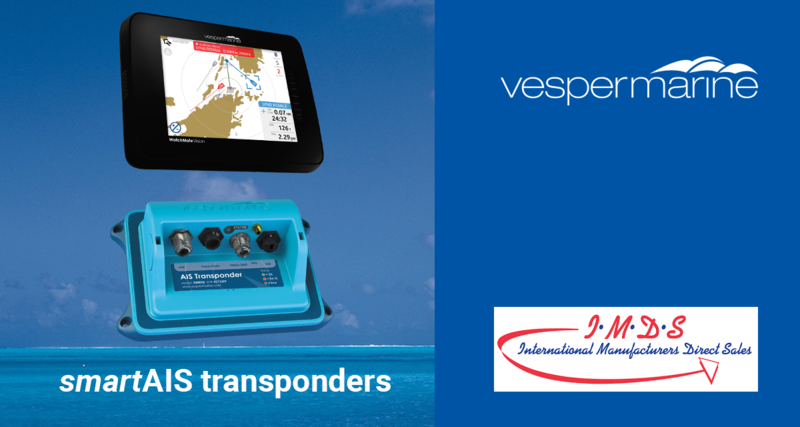 Unlike other transponders that simply send and receive AIS data, Vesper Marine’s smartAIS transponders continuously calculate crossing situations and trigger collision avoidance alarms, plot anchor position to alert the crew of anchor dragging and trigger alarms for immediate man overboard (MOB) retrieval. Vesper Marine smartAIS transponders are proven, highly praised, industry awarded and in high demand. While Vesper Marine already has a strong presence in Europe, the recent signing of IMDS will strategically expand Vesper Marine’s distribution network and customer base and enhance technical support and new business opportunities. The appointment of IMDS complements Vesper Marine’s expansion plan for Europe. The company has recently signed Comstedt in Sweden and OY Maritim AB in Finland.